Online platforms arose out of a need to speed up the execution process for certain types of investments that are used more and more these days. Previously, diversifying your Portfolio meant that you were investing in multiple retail managed investments, which then involved large volumes of paperwork. You completed multiple application forms, compiled multiple reports, capital gains and other taxes were difficult to calculate, and the whole process was extremely unwieldy. Fund platforms reduce your administrative burden so that you and your financial adviser have more time to concentrate on realising your goals (rather than completing excess paperwork). Platforms are designed for one purpose: to simplify the administration, management and reporting of the increasingly complex portfolios investors are accumulating. Essentially, platforms are administration facilities for investment and pension money. They simplify the investment process because they consolidate all the investment reporting and administration for you, and send you regular portfolio valuations and tax statements and all of this can be done online. A platform will give you access to a range of investments across all of the major asset classes - shares, property, cash and fixed interest. With the Platinum Fund Platform there are over 5000 funds from over 200 of the most recognised fund houses to choose from. You're in control of where your money is invested, and with your financial adviser, you can create the financial strategy that's best suited to your financial needs and goals. One major difference between investing through a platform and investing directly is the comprehensive and consolidated reporting provided. You can have 15 managed funds and 15 share investments yet receive just one regular report detailing and summarising all of your financial information. This is particularly useful when it comes to calculating your tax. 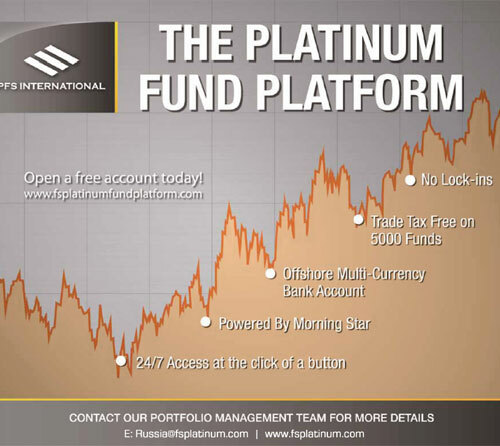 The Platinum Fund Platform gives you online access to your account, so at the click of a button you can see how your portfolio is performing and access other information 24/7. The platform has a built in monitoring system that allows you the Investor to pre-set rise and fall percentage targets with your financial adviser. This is then monitored automatically and when an event is triggered an email notification is sent to both you the Investor and your financial adviser, thereby allowing both parties to monitor the portfolio against your annual target and the risk that was agreed at the first and subsequent meetings with your financial adviser. Diversifying your investments means spreading them around, a feature easily achieved via the Platinum Fund Platform. Many people invest across each of the main asset classes (shares, property, cash and fixed interest), and also invest in a number of securities within each asset class. By placing your money across a number of different asset classes and investments, the good returns you receive from one investment can offset any negative returns from another. We specialise in solutions which provide our clients with the highest quality of service. All of our funds are supported by live Independent Financial Information, provided by Morningstar. Because we provide independent fund data you can be guaranteed all of our product information is entirely unbiased. Emailed Monthly Statements, Planning Tools, Up to date Market News, Independent Research and Transaction Tracker.